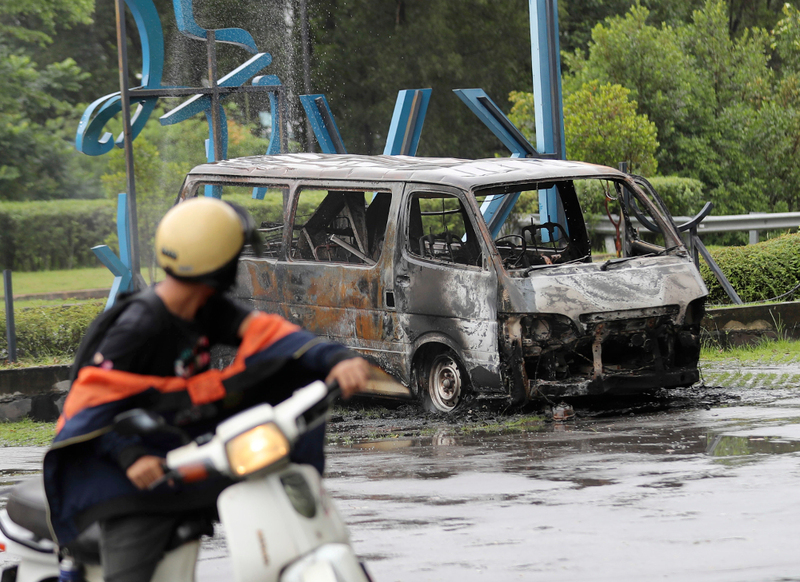 A burned car sits outside the office of property developer MCT Berhad in Subang, a town in Malaysia’s Selangor state, after rioting broke out amid a dispute over the relocation of an Indian temple, Nov. 27, 2018. Conservative Muslim groups pressed Prime Minister Mahathir Mohamad’s government Monday to further protect privileges for the ethnic Malay majority after he renounced his pledge to ratify a U.N. treaty against racial discrimination. On Nov. 23, Mahathir backpedaled on a campaign promise to support the International Convention on the Elimination of All Forms of Racial Discrimination (ICERD), amid a backlash from critics who expressed fears that it could undermine privileges enshrined in Malaysia’s constitution for Malays. Mahathir’s office, in a brief statement 10 days ago, confirmed that his government would abandon the U.N. convention and continue to uphold the constitution. It did not provide a reason for that decision. After the Kuala Lumpur City government announced on Monday that it had given a green light for conservative groups to stage a demonstration against the U.N. convention on Dec. 8, rally organizers said it was not enough for Mahathir to make the announcement through a simple press release. Aminuddin was referring to Mahathir’s speech before the United Nations General Assembly in September, in which he said that Malaysia would ratify all rights-related conventions left for it to adopt, including ICERD. Mahathir made his recent reversal against the backdrop of Malaysia’s race-based politics, raising doubts about the ratification of other treaties. The multi-ethnic nation has ratified just three of the nine core U.N. rights-related conventions: the Convention on the Elimination of All Forms of Discrimination Against Women; the Convention on the Rights of Persons with Disabilities; and the Convention on the Rights of the Child. Last week, Mahathir told news website Free Malaysia Today that he remembered clearly what he said in his speech at the U.N. in New York, rejecting comments that his announcement about ICERD was an about-turn. Mahathir, 93, gave the interview a day after Malaysian police arrested 17 suspects after violence broke out at a Hindu temple in Subang Jaya township near Kuala Lumpur, in what authorities described as an escalation of a dispute over the relocation of the house of worship. Seven people suffered injuries after a group of men attacked devotees and several vehicles were destroyed, police said. Diplomats and analysts said that Mahathir’s statement reneging on his vow to ratify the convention would impact the nation’s image on the global stage over its willingness to combat racism. “The nation must be consistent to become a global role model. Human rights commitments and compliance will be a game changer on the global stage,” Denison Jayasooria, a member of the Foreign Affairs Ministry’s Consultative Council on Foreign Policy, told the South China Morning Post. ICERD, which commits its members to the elimination of racial discrimination and the promotion of understanding among all races, was adopted and opened for signature by the United Nations General Assembly on Dec. 21, 1965 and entered into force on Jan. 4, 1969. As of January this year, the convention has 88 signatories and 179 parties. Malaysia, Myanmar and Brunei are the three Southeast Asian nations that haven’t signed the convention. Religion and race are often political soft spots in Malaysia, half of whose population of about 33 million people is made up of Malays. UMMAH and other similar Malay-based NGOs argue that certain provision of the convention, which seeks to eliminate racial discrimination, goes against the provision of the Malaysian constitution that provides special positions and incentives for ethnic Malays and other indigenous races, including provisions to allow quotas in public institutions. Those incentives are not available for the ethnic Chinese and Indians who make up 27 percent of Malaysia’s population. The Dec. 8 rally, initially planned by the Pan-Malaysian Islamic Party (PAS) to pressure the government to not ratify the U.N. convention, had been changed into a thanksgiving gathering after Mahathir’s announcement, organizers said, emphasizing that more than 3,000 volunteers had registered to help maintain order. The road between Kuala Lumpur’s iconic colonial Sultan Abdul Samad Building and the historic Dataran Merdeka (Independence Square) will be cordoned-off from Friday to prepare for the event. Despite reassurances given on the peaceful nature of the rally, its close timeline with the Subang Jaya Hindu temple riot raises alarm even among anti-ICERD supporters, said Teo Kok Seong, a principal research fellow at the Institute of Ethnic Studies at the Universiti Kebangsaan Malaysia (UKM). Teo, an ethnic Chinese who speaks fluent Malay and reads Arabic, told BenarNews that the situation was still tense after the riot at the temple last week.